Over 100 million cups of our delicious coffee are brewed each year by the Café Valet Single Serve Coffee System, which can found at some of the finest hotels nationwide. 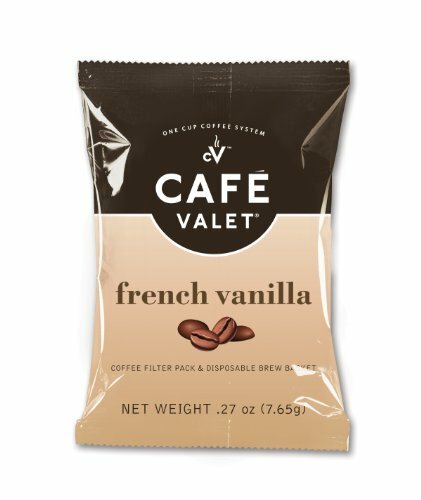 The Café Valet system is an affordable way to prepare single-serve coffee that is consistently delicious and hot. 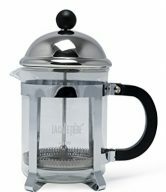 Quality coffee just the way you like it; one cup at a time and without waste. 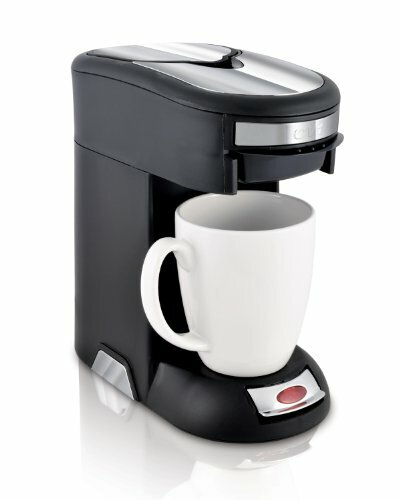 Our coffee comes out piping hot with that fresh brewed aroma true coffee lovers crave. 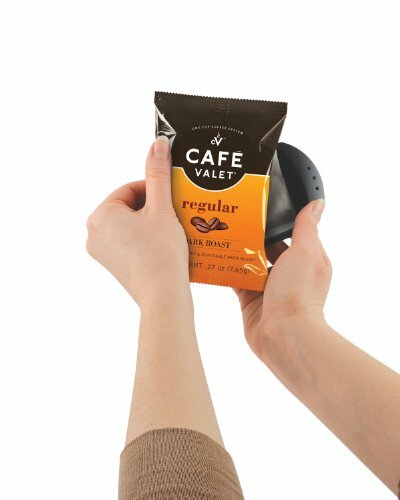 Our patented Café Valet system is easy to use, with just a few simple steps. 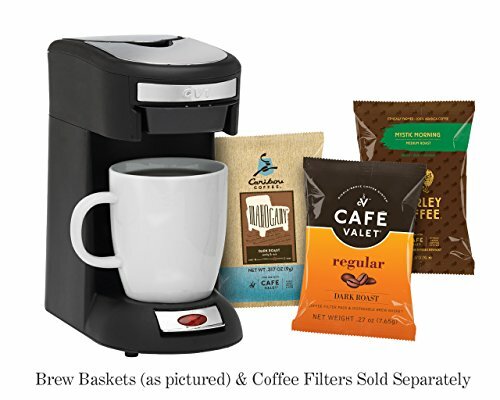 Remove the disposable brew basket and coffee filter pack, insert into the coffee maker, add a cup of cold water to the reservoir, place your favorite mug below the brew basket and press the start button. 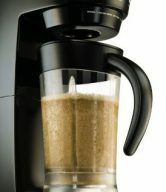 Minutes later, enjoy a hot, delicious fresh cup of drip coffee. There is no mess to clean up. Simply discard the used brew basket and coffee filter. Never again clean a dirty carafe. And since the system automatically shuts off and has no heating plate, it’s worry-free. 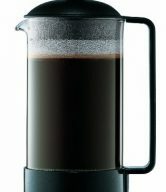 The Cafe Valet Single Serve Brewer is matte black and accented with high luster brush-plated inserts for an attractive finish. The Café Valet machine is dependable and commercially rated, going through a rigorous 3000 cycle test, so you can enjoy it for years to come. Plus it uses just 500 watts, saving you energy and money. 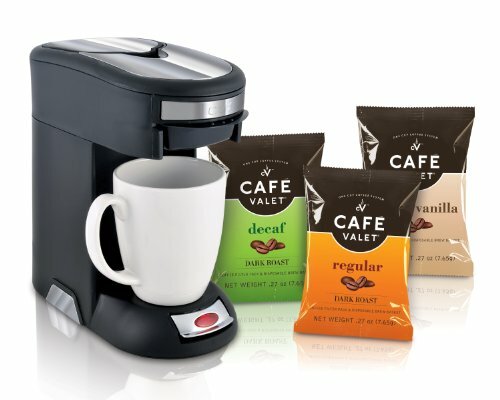 The Café Valet coffee system is so small, portable and affordable, you can buy more for your home, office, workshop, garage, vacation home, college dorm or apartment. 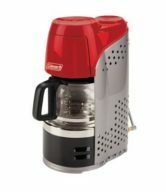 And as a bonus, it also provides a ready source of hot water for tea and dry soups/noodles. Great Taste and aroma. Economical. No waste and no messy cleanup. That’s Café Valet. Item top is mirrored and textured. Works exclusively with Café Valet disposable brew basket and coffee filter which means easy to use and no mess, no waste or glass to clean.